Demanded by Drummers - and just ready in time to be included in this catalogue . This is the latest narrow snare drum with the crisp, snappy tone. Ideal for recording and broadcasting. Special FLANGED STEEL counter hoops and entirely new self-aligning tension saddles, with side-by-side tensioning screws for perfect separate tensioning of snare and batter heads. A novel adjustable snare fitting, with instant throw-off, controlling coiled wire snares on plastic endplates. All metal parts chromium plated and polished. Best white calf batter head and matched slunk calf snare head. Available in white or black mirror plastic, white pearl or blue pearl. A magnificent and versatile snare drum responding to the very lightest touch, but with unlimited power. 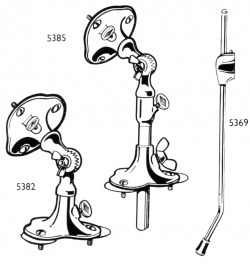 The new 522 is the drum for the progressive drummer who will settle for no less than the best. Laminated wood shell. Eight self-aligning tension fittings. Positive action snare mechanism with 20-strand coiled wire snares. 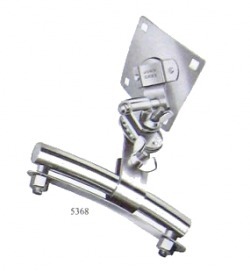 All metal parts heavily chromium plated and polished. Adjustable internal tone control. A new all-metal snare drum designed for the drummer requiring an exceptionally crisp, penetrating tone. 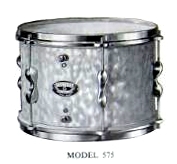 Specification as model New 522 but with 5" deep chromium-plated metal shell. A narrow shell model with exceptionally crisp penetrating tone, equally suitable for large or small band work. With laminated wood shell, heavily reinforced, covered with pearl or glitter plastic. Self-aligning streamlined fittings, heavily chromium plated and polished. One or two adjustable tone controls. Laminated wood shell, strongly reinforced and covered with pearl or glitter plastic. Hoops are covered in plastic to match, ornamented with bands of contrasting enamel. Eight John Grey self-aligning tension fittings, chromium plated and highly polished. Two adjustable internal tone controls. Fitted with selected, matched white vellums. Concealed floating bush ensures perfect self-alignment. Screw can neither bend nor bind. Strong ? absorbs strain without risk of distortion. Smooth contours cannot become dust-traps. Unbreakable steel claw - a one-piece stamping. Tympani handle of great strength - large size for easy and accurate tuning. A complete and comprehensive outfit selected from the John Grey AUTOCRAT range together with fittings and accessories of the highest quality. The drums and Tom-Toms are available in Black or White Mirror Plastic or in White Pearl or Blue Pearl, to choice. Die-Moulded counter hoops, with cushion rims and solid tension lugs. HEADMASTER plastic heads on Snare Drum and Tom-Toms. Disappearing Bass Drum Spurs and Cymbal Arms. Black or White Mirror Plastic, Marine, Grey or Midnight Blue Pearl, Red or Turquoise Glitter.